- 2 Bedrooms, 1 full bathroom, 1 half bathroom Sleeps 6. Completely restored antique colonial home available year-round. Complete with wide plank flooring, beamed ceilings, and 2 bedrooms (1 bedroom has 2 double beds; 2nd bedroom has 1 double bed), living room with fireplace, den, modern full bath and new half bath & new kitchen with dishwasher. All conveniences and tastefully furnished. Mountaintop with great views & privacy, yet accessible. Well behaved pets are allowed at slight additional cost. Large breeds accepted. Property Details: Completely and authentically restored circa 1750 colonial home available year-round. Surrounded by thousands of uninhabited acres; property is secluded, yet easily accessible, located on quiet country road with the nearest neighbor 1/2 mile away, yet just a few miles from Rte. 110 and the typical Vermont small town of Washington. This home is privately situated at the end of a well maintained tree lined town road at Nineteen Hundred foot + elevation with magnificent Northern views. 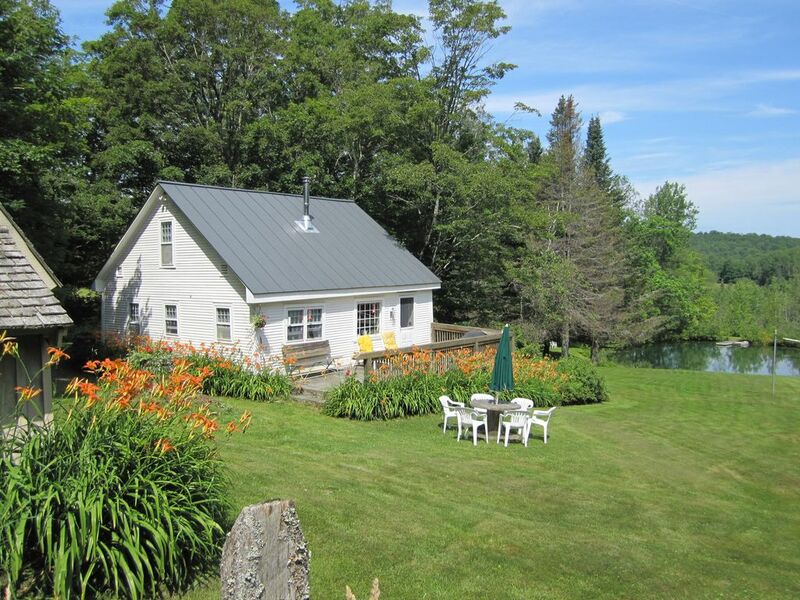 Situated in Central Vermont, old timers claim you can see Canada on a clear day from the field behind the house. Constructed hundreds of years ago as an original Post & Beam Cape, the home is complete with original wide-plank floors (honey colored), beamed ceilings, and more, and includes two bedrooms (sleeps six comfortably), living room with fieldstone fireplace, den, and modern bath and kitchen, with large flagstone rear patio. All conveniences including color TV, DVD & VCR, piped in stereo, telephone, microwave, washer and dryer, and tastefully furnished in a very comfortable decor. With its efficient heating system and generator backup it is comfortable year round in all sorts of weather. Authentic restored Antique Post & Beam home with wide pine floor and antiques. Golf: Ten Excellent Public Golf courses are within a short drive; Two of the closest golf courses are among the best and have been in operation for a century; the Barre Country Club and the Montpelier Elks Country Club. Both of these courses have excellent course and slope ratings, maintain well stocked pro-shops, and offer golf at its finest, as well as exceptionally scenic views of the Central Vermont countryside. Ski: Cross Country Skiing- One thing Central Vermont rarely runs out of is snow, particularly at higher elevations such as this house. The grounds and surrounding fields and woods are ideal for cross country skiing either on snowmobile trails or freshly fallen snow. Or, travel to Trapp Family Lodge Cross Country center in Stowe (45 miles) and experience excellence in groomed trails of all ability levels. Downhill Skiing/Snowboarding- Within an hour door to door ( 45 miles) is either Stowe/Mt Mansfield 'There's only one Stowe' which boasts Mt Mansfield, Vermont's highest peak and a wide range of terrain for every ability level. Stowe is known for its double-black diamond 'Front Four' trails, but also offers some great intermediate cruisers and a lovely group of beginner trails. Or travel to Sugarbush/Mad River Valley (45 miles), home of 'the most widely varied ski terrain East of the Rockies'.